Today, we will deal with Kernel Panic upload mode error that arises when you reboot your Android phone or after performing a factory reset. I came across this error when I tried to hard reset my Galaxy Note 4 from the recovery menu. First, I wasn’t sure what it means. It mostly arises when the firmware is not working properly. There is some problem with the firmware or it has malfunctioned. My phone was rebooting at random intervals after I saw this error. It was really troublesome for me. After each reboot, the screen will display this error. Note: This guide works for every Samsung Galaxy Phone running on an Android operating system. I tried a number of things to fix this issue. I will list them all in this post. Maybe they will help you to fix kernel panic upload mode error. There is a number of reasons that can be causing this problem. It can either be the firmware or some app. One solution is to uninstall “Advanced Task Manager“. The task manager sometimes malfunctions and starts ending wrong processes which cause the kernel to crash. Uninstall any task killer app or system cleaner app which frees up memory on your phone. Use the Android default task manager. First of all turn off your Android phone. Once it’s completely turned off. Enter into recovery menu by Pressing Volume Up + Home + Power button simultaneously. Keep on holding the buttons until you see Android figure in the background. Now in the recovery menu. Locate Wipe Cache Partition. Use volume buttons to navigate to it. Now Press the power button to select it. Select on Reboot system now. Cache allocated to apps can be causing trouble at times. Clearing it enhances the performance of your phone and fixes the unorthodox behavior of phone. If clearing cache didn’t fix the problem then you might have to factory reset your phone. 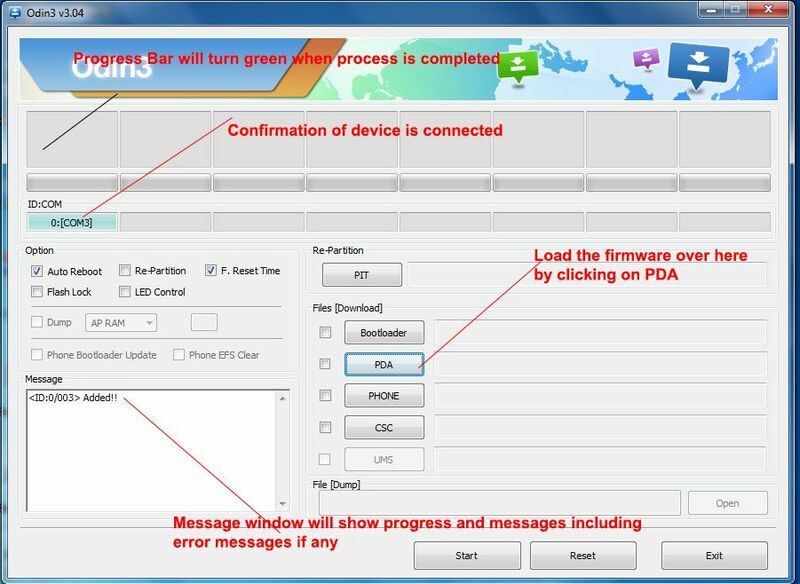 Just go to Recovery menu using the steps above and select Factory Reset/Hard Reset. It will delete all the data present in your phone. Make sure you make a backup of your phone using this guide before you perform a factory reset. If you are getting this error on your Samsung Galaxy phone. Then use the guide below to install a fresh firmware on your phone. If the software is causing the problem. Installing a new software/firmware will eliminate kernel panic upload mode error once and for all. In this guide, I will demonstrate step by step how you can fix Kernel panic upload mode by flashing stock firmware on your Android phone. Download ODIN v3.10.7 from here. Download Firmware for your Samsung Galaxy phone from SamMobile. And extract it on your PC. Select the firmware which matches your country and brand (e.g T-Mobile, Verizon etc). If your phone is unbranded, you can select any unbranded ROM. Download Samsung Drivers for Windows. (Link to download file is under the main heading). These drivers are to be installed on your PC, they are essential for your PC to recognise your device. You will need a computer for this solution. Selecting the right ROM is very important. If your phone is carrier unlocked and it does not have any carrier branding then you can download ROM of any country that is not branded. To check branding see if logo of some carrier (like Verizon or T-Mobile) appears when you reboot your phone. If your phone is not branded then you can flash ROM of any country which is not carrier specific. Make sure you don’t flash unbranded ROM on a branded phone. Although, it is recommended to find the exact same ROM as the one that was installed on your phone before it got bricked. If you found exactly the same ROM as the one installed on your phone. Your data won’t be deleted. Download ODIN on your PC. Install Samsung USB drivers for windows on your PC or laptop. Now turn off your phone. Get it into Download mode. Press Volume Down, Power button and Home Button simultaneously. Keep on holding till you see a warning. Now open ODIN on your Windows PC. Connect your phone to your PC using USB data cable. ID:COM will turn blue, its an indication that your phone is connected and recognized by your PC. If your phone is not recognized. Make sure you have installed proper Samsung drivers on your computer. Click on AP or in some ODIN versions PDA. Select the stock ROM with (.MD5 file extension) you downloaded from Sammobile. Make sure Only Auto Reboot and F. Reset Time are checked in the options. Like in the screenshot below. That’s it. Click on Start and wait for 10 minutes. Now ODIN will flash Stock ROM on your Galaxy phone. Your phone will reboot on its own after the flashing. Put the BL file in BL tab. Select CP tab and select the CP file in it. Select CSC tab and select HOME_CSC file in it. If the flashing is unsuccessful. Try again using some other version of ODIN. That’s all on how to fix kernel panic upload mode error on Android phone. If you have any questions or queries regarding any of the method above. Feel free to ask me in the comments. Do give us feedback on which method helped you to fix this issue.